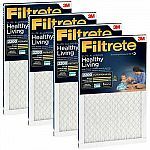 COSTCO has 3M 2200 Series Filtrete Filter 4-pack (1" Thickness) for $45.99. Shipping is free. Thanks dealsea! I was waiting for this deal.